A fiddle-driven dance group who take their inspiration from the traditional music of Scotland and Ireland, as well as Cape Breton, Nova Scotia, where the fiddle is the main instrument for set dancing. 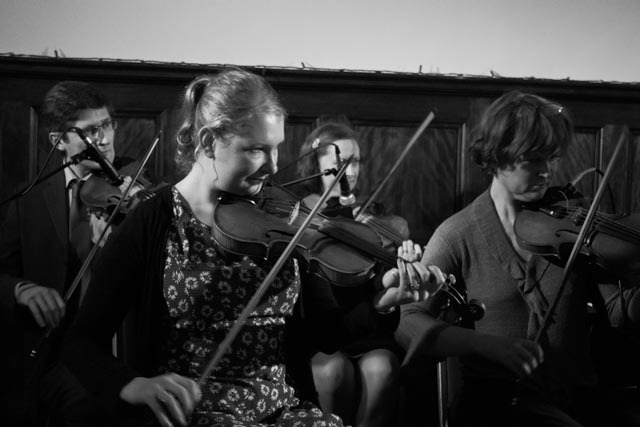 It has been together since 1995 and the core membership has included Mairi Campbell (fiddle), Sarah Hoy (fiddle), Anna Wendy Stevenson (fiddle), Dave Francis (guitar and caller), Robin Galloway (double bass), Fiona Moore (piano). Our members are well known on the traditional music scene, playing with bands as diverse as The Cast, Jock Tamson’s Bairns and Fine Friday. We include a wide range of dances in our programme, almost all Scottish, some of which have not seen the light of day on an ordinary dance floor for a couple of hundred years. Caller Dave Francis keeps dancers right, and keeps it clear and simple. The band has provided quality Scottish music for celebrations, community events and festivals- from the Isle of Lewis to the Borders and beyond, in locations from castles and palaces to village halls and marquees. This track was recorded at Portobello, Edinburgh. Featuring Derek Hoy, Mairi Campbell and Anna Wendy Stevenson, fiddles.